Las Vegas has so many attractions that quite often some great spots just seem to get less attention than they deserve. 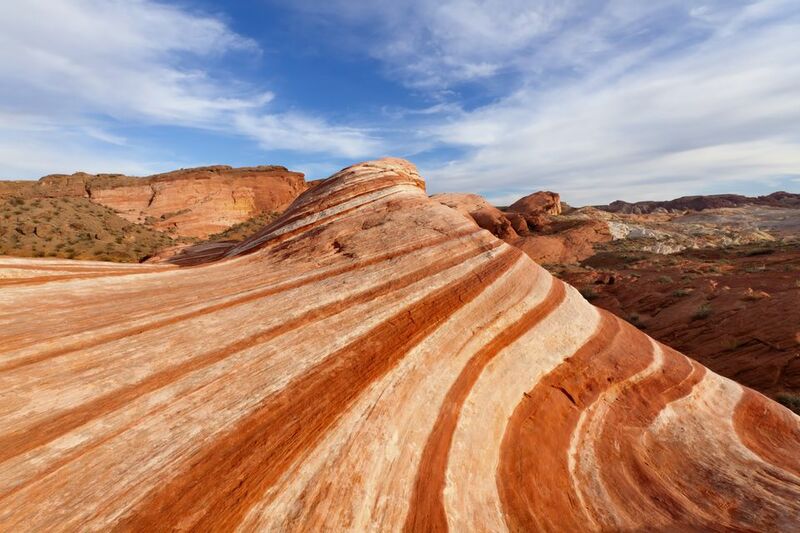 Take a hike in a slot canyon or drop a quarter in a pinball machine and you'll discover a few of the underrated attractions in Las Vegas. When your night ends order a classic cocktail at a bar with one of the best views in Las Vegas and ponder just how many under explored attractions are waiting for you on the Las Vegas strip. It just under 20 miles to Red Rock Canyon from Caesars Palace and the center of the Las Vegas strip but once you are there you will forget that you any where near sin city. The red rocks climb to the sky all around you and the layers of rock break up the landscape in patterns that ebb and flow through the sight lines of your soul. Is this some form of environmental hyperbole? Well, stand in this valley and you’ll see just how beautiful the southwest can be and just how easily you can remove yourself from the chaos of Las Vegas. If you crave outdoor spaces Red Rock Canyon will tempt you with strenuous trails and relax you with quiet spaces filled with the sounds of nature. If you love wine but you rarely want an entire bottle you should seek out the little talked about but veteran of many late nights, Wine Cellar and Tasting Room at Rio Las Vegas. This hidden gem can be found in the cellar at Rio and it has over 100 wines by the glass. The Wine Cellar is setup like a museum for wine that has plenty of great bottles on display from its impressive collection. Some rare bottles that are on display include a bottle of 1800 Madeira from the cellar of Thomas Jefferson, the only bottle of Domaine de la Romanee-Conti Echezeaux 1985 (6L) in Las Vegas and the only bottles of Massandra Muskatel Crimea Ukraine 1900 in the country. Find a seat at the bar and get a quick education on the art of collecting wine or just meet down there for a rendezvous in a quiet, out of the way spot. At first you'll feel bad because you continue to stare but soon you'll realize that this is a labor of love for Pete Valee who plays Big Elvis at Harrah's Las Vegas. Big Elvis performs at the Piano Bar at Harrah’s Las Vegas three times a week and you must find sometime in your afternoon to watch and listen. This is Las Vegas showmanship but the show is very well done and you’ll find the sincerity and passion exhibited by Big Elvis will impress you. He’ll sing songs from The King as well as other popular hits. His interaction with the audience is genuine and the show makes this one of the best free attractions on the strip. Harrah’s Las Vegas Monday, Wednesday and Friday; 2 – 6 p.m. Guests must be 21 years of age and older. If you need a spot to spread out to watch a game or celebrate a bachelor who is leaving the brotherhood, The D Las Vegas is where you should do it. The "Man Cave" spaces that feature 11,000 square feet of meeting space feature arcade games, plush leather couches, beer-pong tables, full catering service, big screen TVs and the fastest Wi-Fi technology in Downtown Las Vegas are perfect for your personalized party. The long bar downstairs and the zip line out on Fremont street only add to the adventure. It seems like this indoor amusement park should get more attention, I mean, it is climate controlled and it is steps away from a casino. Ok, maybe you don’t go to Las Vegas to revive your love for rollercoasters but at Adventuredome you get a taste of what you craved as a kid with little to no lines and a convenience not found in amusement parks back home. If you are traveling with kids the options are endless and it is one of the few places where teenagers will actually have a good time in Las Vegas. Adults might be a bit dismayed at the thought of heading to an amusement park but consider the last time you took a little break in your schedule for a good heart pounding ride. It's been too long! Ride the lightning. Las Vegas lounges are in abundance in every hotel on the strip but a classy lounge with good food and an inviting atmosphere is rare. You see, a good spot might have great cocktails but lack food. Others are impressing patrons with great food but limited selections when it comes to drinks. Vice Versa at Vdara puts the complete package together for an afternoon meeting spot away from the casino noise or a spot where conversations are valued and a night cap turns into a prolonged mingling session deep into the night. The menu is somewhat of a Saints vs. Sinners theme so you can choose your experience from mild and tame to wild and adventurous. Be careful, a few of the cocktails on the menu will tempt you to misbehave and the food items will definitely get you to over order. Take a tour of the home of the original Mr. Las Vegas, Wayne Newton. Case de Shenandoah is filled with so much Las Vegas history as seen through the eyes of this iconic performer. A visitor center welcomes you and walks around the lush estate are encouraged. The grounds of the estate are extraordinarily beautiful, fresh and clean where guests can roam and see his Arabian horses amongst a wide variety of other beautiful animals and his mini pony named "Donkey Schoen." The estate tour features a video of Wayne talking about what you'll see and a showcase of a lifetime of Newton’s memorabilia including gifts from legendary celebrity friends such as Frank Sinatra, Elvis Presley and Jack Benny. Also on display, his personal collection of rare automobiles, a private jet and each of the rooms within the mansion with many of his former costumes showcased. The sound of a pinball machine is similar to the sound that slot machines once made. The clanking and ringing is a reminder of a simpler time. Slot machines no longer drop coins and pin ball machines are now almost extinct. However, tucked away in a 10,000 square foot space just a few minutes from the Las Vegas strip the Pinball Hall of Fame is home to 140+ Pin Ball machines that will help you relive the days of yesteryear. There is no better place for a cheap date or a family excursion in Las Vegas. Make change for $20 and you’ll be playing pinball all day long. There is nothing fancy about this place except for the fact that you can play for a very long time for a dollar. You'll wonder how long you can sit and lounge at Skyfall Lounge at Delano Las Vegas before they'll ask you to leave. The views of Las Vegas are mesmerizing and the cocktails deliver enough flavor and pizzaz to effortlessly subdue your need for a schedule. The lounge is located high atop the Delano Hotel and adjacent to Rivea Restaurant. This is that spot that nobody tells you about because they want the seats that are out on the patio. They want the view all to themselves. Go ahead, take it from them and make sure to stay longer than you should. Dinner is impressive next door but a seat on the patio is priceless. You'll probably take way too many pictures and with the quality of the cocktails there is a good chance you'll have too many of those as well.